Troy Nelson Guitar Aerobics PDF + Mp3 CD download. A 52-Week, One-lick-per-day Workout Program for Developing, Improving & Maintaining Guitar Technique. From the former editor of Guitar One magazine, here is a daily dose of technical vitamins to keep your chops fine tuned! Musical styles include rock, blues, jazz, metal, country, and funk. Techniques taught include alternate picking, arpeggios, sweep picking, string skipping, legato, string bending, and rhythm guitar. These exercises will increase speed, and improve dexterity and pick- and fret-hand accuracy. The accompanying CD includes all 365 workout licks plus play-along grooves in every style at eight different metronome settings. The explanations are mostly very clear and detailed, and it’s useful to have exercises that cover a range of styles and genres which you might not ordinarily tackle if you just based your playing on learning tunes. It builds week on week, so there is progression in the complexity of the exercises over time, and this works well with the ‘workout’ idea of the title, pushing your limits just a little further each time. This book is for beginners to advanced, with guitar tab for each day of the year. You start on Monday repeating each exercise ten times. It starts out easy and becomes more difficult as you go. It’s made for those who love guitar plectrums (or guitar “picks” for short). It can also be good for fingerpickers as it helps your left fretboard hand gain musculature and dexterity. A must for any rocker! Also, there are 2 CDs included – one with the sound that you should actually produce while exercising and the other with rhythm supplied by drums for each exercise. Pay attention that the workouts are played using ELECTRIC guitar. It is systematic, well laid out, the exercises increase in the skill needed to perform them, workouts are short and don’t take too much time to get into them. But the biggest benefit is that you have your workouts laid out for you for the whole year – you just need to concentrate on your 10 minutes of working out per day and in a year’s time you can’t be a worse player than you are now and if you have discipline to make it 10 minutes per day – you will probably enjoy playing more and more, workout more ore better and really improve in much much shorter time. 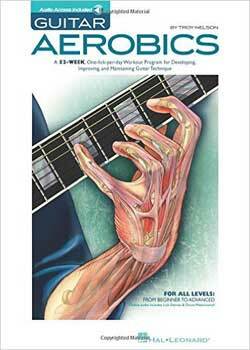 Download Troy Nelson – Guitar Aerobics PDF free and other books from our site. Only high quality PDF scans. Please write a review, it's important for our community. Very good for enhancing your finger skills. This has a variety of tasks for everyday which continuously focuses on different type of techniques gradually like scales, string bending, hammer on, pull off, slide, chords etc. Recommended for all beginners.